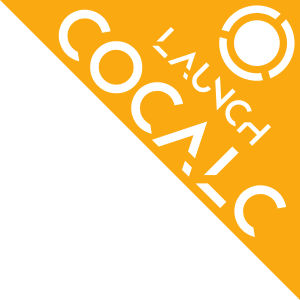 The following software is used by CoCalc under the hood. It’s either installed directly or slightly modified to fit into the infrastructure. Besides that, there is a more detailed and fairly up-to-date list available. 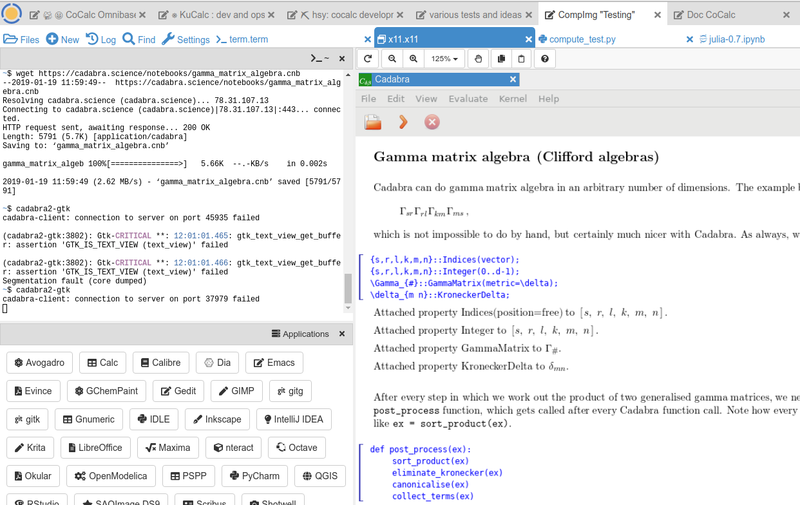 SageMath – Sage is an open-source mathematics software system. It is the patron for CoCalc’s former name “SageMathCloud”. IPython – This is a shell, a notebook and a distributed computing environment built on top of Python. LaTeX – CoCalc provides the capability to author LaTeX documents online. This is a typesetting system with a focus for high-quality layout and formulas. Besides pdflatex, also other variants like XeTeX and LuaTeX are installed and available. Linux – The famous open-source operating system, which holds together everything. The used variant is Ubuntu. Via the Software Environment selector, you have a little bit control over the software you’re running in your project. Recent updates to CoCalc’s software stack available in the “Default” environment. (upd) pandas 0.24.2: check pandas release notes for changes since 0.23. (new) umap-learn (UMAP example): Uniform Manifold Approximation and Projection (UMAP) is a dimension reduction technique that can be used for visualisation similarly to t-SNE, but also for general non-linear dimension reduction. (new) ttf-mscorefonts Linux package to provide more fonts, primarily for XeLaTeX. (upd) routine Linux package update, including xpra-2.5.1. 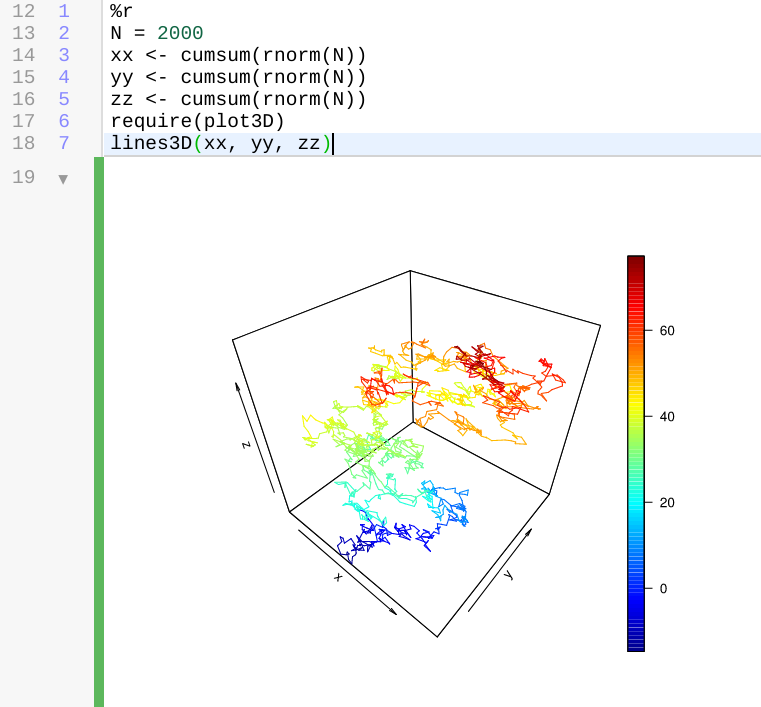 (new) Orange 3: Open source machine learning and data visualization for novice and expert. SageMath 8.7 is the default sage. You can still use the previous one via sage-8.6, select the appropriate kernel, or switch it in your project by running sage_select 8.6 in a Linux Terminal. (upd) bioconductor packages, in particular affy, limma, puma, etc. Spyder IDE 3.3.4 (via X11) and Python 3 deps: PyQt5-sip-4.19.15, pyqt5-5.12.1, pyqtwebengine-5.12.1, qtawesome-0.5.7, qtpy-1.7.0, spyder-kernels-0.4.3, and wurlitzer-1.0.2. and some more updates like IJulia for the notebook. Version 8.7: initial deployment, still needs testing. Try it and give us feedback! – SageMath 8.7 demo. (UI/Chat) @Mention a project collaborator in a chat to ping her/him via email. Julia 1.1: adding Images and updating various packages like JuMP 0.19! LEAN 3.4.2, with a precompiled mathlib in /ext/lean/lean/mathlib. Sphinx-1.8.4 (update) and commonmark 0.8.1 and recommonmark-0.5.0 for developing sphinx-rtd-theme-0.4.3 out of the box! (Julia): making Julia 1.1.0 the default (v1.1.0 release notes) and removing older, no longer maintained versions. Maybe cleanup the build cache, by running rm -rf ~/.julia in the Terminal/Miniterm. (sage): Sage 8.6 is the default! (use sage_select 8.4 to switch back). Enjoy the shorter startup time, which also speeds up compiling SageTeX documents! (chg) As announced previously, Julia version 1 is the default now. Symlink ~/bin/julia to julia-0.7 if you need to switch back. Julia 1: * JuMP & Ipopt (demo julia-1-jump.ipynb) * We’ll also switch the default version of Julia to be 1.0.x soon! Julia 1.0.3: comes with packages PyPlot, Plots, DifferentialEquations, Compat, LinearAlgebra, GLM, etc. now!